Employer Branding: The New Mantra For Talent Acquisition | Business Article | MBA Skool-Study.Learn.Share. Simply put, the way a customer is attracted to the product and often becomes loyal to it. Similar is the case of an organization, an employee these days doesn’t go merely by the compensation but the entire package, moreover as in the case of products ,the employees are spoilt for choice. So, organizations in the face of the growing talent crunch are falling over themselves to bag the best in the market by differentiating themselves. The need for insidious poaching is passé ,now it’s about building brands for future talent to be attracted to it. So how does Employer branding work? Employer branding is a mirror to the culture, organizational structure the HR Practices of your Company and of course-the PR department. An organization needs to project an image of providing challenging and enriching work, autonomy in decision making and being a socially responsible organization. 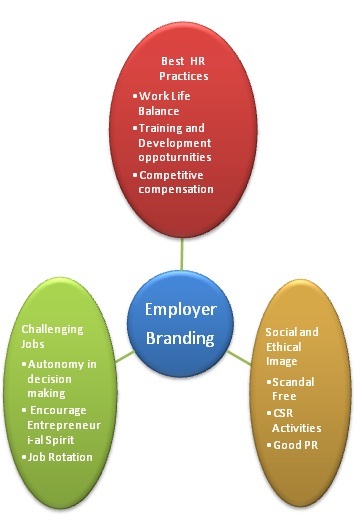 How to build the employer brand? 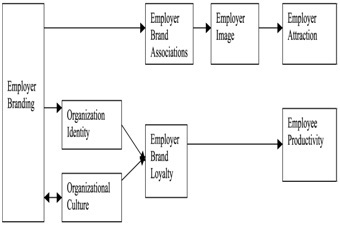 Employer branding is a continuous process. It is a fine blend of creating a value proposition, external branding and internal branding activities. Creating a value proposition aims at providing the central message conveyed by the brand. It gives the true representation of the brand using its organization culture, management style and impressions of product or service provided by the brand. External branding which has been later dealt with in the article aims at attracting the target population, designed to support and enhance the corporate brand. It acts as a critical differentiator. Internal branding exposes the workers to the value proposition created by the employer. It aims at creating sync between the workplace culture and the corporate goals, enables the organization to achieve a competitive advantage. These processes are simultaneous and interdependent on each other. There should be a true alignment of the internal values of the organization with the external expression of the brand to project a cohesive image of the brand. External branding acts as a critical differentiator between reactive and proactive organizations. It is designed keeping in mind the interests of its target audience. Target audience is the prospective employees and the current employees and what better way to approach them than the social network. In the globalized world, the brand not only caters to the domestic audience but the rest of the world also wants to know when facebook has a opening at Pao Alto. Not having active presence on the web is social suicide, if you want prospective employees like consumers to recall your brand; you have to constantly remind them by selling yourself as a place employees can aspire for. Social networking –Twitter, LinkedIn, Facebook etc. Offline networking- seminars, conferences etc. have provided organizations with ample arenas to create and promote their brand equity. But along with this comes the challenge of creating a positive and socially responsible organization. Once an organization is able to successfully create this brand identity then it must adhere to this promise as well as nurture and maintain it. This article has been authored by Charu Puri & Sakshi Kharbanda from IMI Delhi.